Comments Off on Why is the color green used for ordinary time? Prayer involves all of our senses. It involves being alive to touches of God’s grace everywhere around and within us. Color in a church is more than decoration. In public worship, it has a role similar to music, art and architecture of a church — to teach, to inspire, to help gather our thoughts. 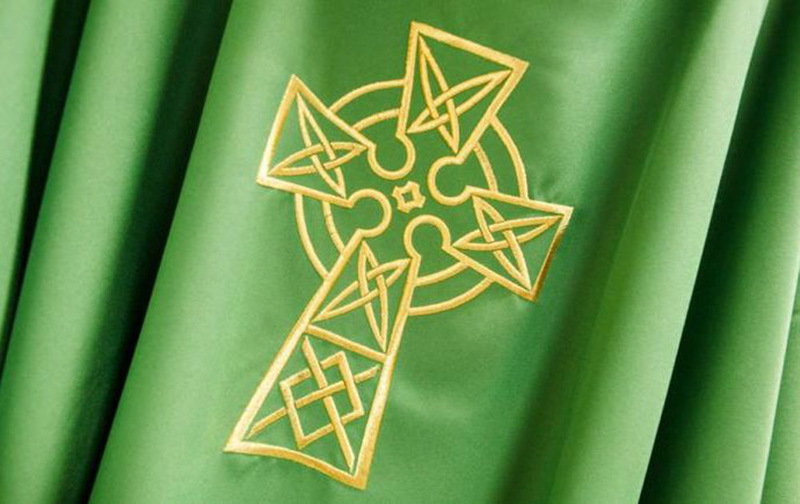 Green is used as a liturgical color during the weeks known as Ordinary Time. Generally, this period of time occurs from the end of the Christmas season until the beginning of Lent, and from the end of the Easter season until the beginning of Advent. Far from being a filler between other liturgical seasons, Ordinary Time has its own meaning, signified by its own color. At its etymological root, the word “ordinary” has a rich meaning, far beyond the usual understanding of humdrum, commonplace or everyday. The word has its source in a Sanskrit, or Indo-European, word, which entered into Latin as the verb orior, meaning to rise up, to be stirred up and to grow. The word for “east” in Latin, oriens, conveys the same rich meaning: It indicates the rising of the sun. Hence, Ordinary Time is, for Catholics, the opportunity to allow the Lord to stir up our faith, to allow our spirits to rise and to grow in our spiritual life. The color green brings this meaning to the fore, since it is a color that evokes life and growth.